The Edgefield Community Development Association along with our special sponsor, Bluegrass Material’s Edgefield Quarry, invites everyone to our Downtown Drive-in movie night on the Square in historic Edgefield on Saturday July 20, 2013. Bring your family, your neighbors, and your friends and gather around the Edgefield Square for the YabbaDabba fun filled showing of “The Flintstones.” Dress up as your favorite character for a chance to win a Yabbadabba dazzling prize! Have your picture taken standing next to a giant Caterpillar front end loader from the Quarry and enjoy some rock candy, dinosaur tattoos & bubbles provided free by our sponsor, Edgefield Quarry. Events start at 7:30 p.m. with the costume judging at 8:00 & the movie will start around 8:30 p.m. Remember to bring your lawn chairs or blanket and enjoy another fun-filled movie night under the stars. The movie will begin at Dark with the Wells Fargo Bank Building again being the movie backdrop. Snacks and sodas will also be available for purchase from the Boy Scouts, sandwiches, watermelon and desserts available from the Civic League. 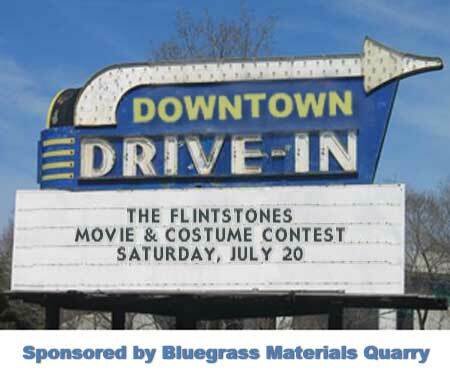 The Edgefield Community Development Association would like to pay special thanks to Bill Lowish and his wonderful staff from the Edgefield Quarry for sponsoring the July 2013 Downtown Drive-in movie and costume event. Come out and enjoy the fun! Parking is available at the Discovery Center parking lot, the Dialysis Center, Edgefield First Baptist, and along the side streets of Edgefield. Please make sure all dogs are on leashes and that they enjoy being around young children. Rain date is Sunday July 21st. If you would like to sponsor a future movie night or have any questions, please contact Christy Pillars at (803) 474-8847.